The first thing to say is that this is a notable achievement by all concerned. 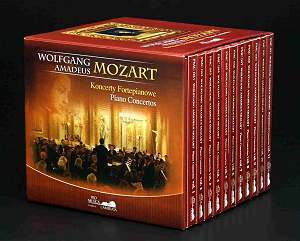 To perform and record all Mozart’s piano concertos “in one go” as it were, is a considerable task and the results here are very refreshing and remarkably consistent throughout. There have been of course sets of the complete concertos before and I have Barenboim (twice) (EMI, Warner), Schiff (Decca) and Perahia (Sony) as well as a compilation produced by Warner last year. They all have their respective merits as well as occasional deficiencies. Unlike the present collection the sets I have were recorded over a longer period of time and separate discs were released before being packaged. Mention should be made here of the very handsome box in which all eleven volumes are placed: no slim-line package here. For people like me with a space shortage this is a double-edged sword! There have been “authentic” recordings previously - notably by Malcolm Bilson under John Eliot Gardiner and the English Baroque (DG) but one feature here is that we have all 27 plus juvenile works based on J.C. Bach; Bilson and co, recorded in the late 1980s, start at Number 5. Viviana Sofronitzki comes from a famous musical family and is clearly highly proficient at the demanding forte piano which would have been the instrument used at their original performances; often led I believe by the composer at the keyboard. Here the pianist is accompanied by Musicae Antiquae Collegium Varsoviense who are from Warsaw and apparently have over half a century of recording behind them. They are certainly a fine set of musicians and the conductor Tadeusz Karolak shows great empathy in his role. The forte piano is a replica of the Anton Walter fortepiano by Paul McNulty and very good it sounds too. The recordings are not placed in chronological order which might have been advisable and especially so if the discs are available separately. The set begins the "Jeune homme" from when Mozart was twenty. For the general listener this is a good place to begin. It’s on quite a big scale and the orchestral sound is clear, avoiding the acidity of older “authentic” bands. Sofronitzki plays this extremely proficiently and the forte piano works well with this piece; this was a good beginning to my voyage. As my listening went further through the set I became aware of various points. The first of these was the imagination and originality of Mozart and how he developed so quickly - some of these concertos were written very close together. Secondly, that the Musicae Antiquae Collegium Varsoviense are a very fine ensemble and I would love to hear them in Haydn and Mozart symphonies. Thirdly, in the mid-period works - up to say Number 19 - I felt convinced by the approach and sound without yearning for a piano-forte. The Hunting Rondo of Number 22 was also a case where the sound was fine and although I will return to Perahia et al this will be a version to play often. The early works also benefit from being played on instruments adjacent to their composition and Viviana Sofronitzki is as adept on the harpsichord in the juvenilia as she is on the forte piano. To get an idea of this set’s strengths there is the last movement of Number 16 on Viviana’s website and whilst I got to love this via Barenboim and BPO (Warner) the quality of this performance encouraged me to embark on the whole eleven disc collection; a task which has been revelatory and highly enjoyable. Beecham used to say everyone should listen to Mozart fifteen minutes a day for five years! Starting my day with one of these concertos has been uplifting. Take as a strong example; K456, No.18 on Disc 8 - a splendid combination of orchestra and soloist. The slow movement has echoes of some of Mozart’s darker operatic moments and here I found the forte piano enhanced the experience. The rondo with Mozart’s roguish fun, fiendish writing for the keyboard and splendid wind playing saw me off to work with a great feeling of wellbeing! This collection also includes the concertos for three and two pianos; the latter has been an especial favourite since I saw Christopher Nupen’s film “Double Concerto” featuring Ashkenazy and Barenboim playing this in Croydon in about 1967. This piece was written about the same time as the Sinfonia Concertante K 361 and has similar qualities of charm and imaginative writing. This is given a fine performance here and again the orchestral playing is of the finest. If I say I prefer Gilels – father and daughter (DG) - it is largely what one is used to but those drawn to less romantic playing will probably prefer Viviana Sofronitzki and Linda Nicholson. The “Triple concerto” is a less distinguished piece but is again executed in lively fashion. It should be pointed out that the speeds are fairly similar to modern practice and never seem rushed as was the case in certain “authentic” performances in the 1980s! The mild problem I have has been in the very familiar later concertos; for example 20, 24 and 27 where I felt slightly short-changed by the experience. The forte piano, however expertly played, produces a certain similarity of texture which becomes repetitive at times and slightly detracts from the full delights of these works. Turning to a very fine modern piano recording by Piotr Anderszewski (Virgin) the speeds are very similar but the piano forte is better equipped to deal with the emotion and force in the “Romanze” of Number 20. Of course I’ve been listening to this work for 45 years and got used to a certain sound and style. Mozart would have heard his works similar to these recordings but was he not composing with a sound in his head which was beyond the instruments of the day? Did not his and later Beethoven’s compositions inspire manufactures to make greater sounding instruments? It’s an unanswerable question but so long as no-one says there’s a right way and a wrong way I am happy to listen to different ways of interpreting these marvellous works. Listening to this collection has been very enjoyable, particularly with such a consistent standard. I do commend this set to all interested in hearing this great music on instruments of Mozart’s period and hope that we may have the opportunity to hear these fine performers in this country at some stage soon!